Well we have just returned from a great trip travelling through 3 states, 3 National Parks and seeing some amazing scenery on the way. 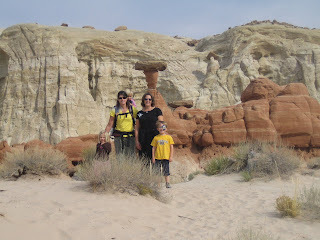 Our holiday took us through Colorado, Utah and Arizona, our aim being to have fun with the Sweatlands in Page, AZ. Well we truly achieved our aim. It was good to see everyone carry on with their friendships from where they were left in August. Carrie and Brian were excellent hosts, as usual, and Jake and Annie warmed immediately to the whole family. 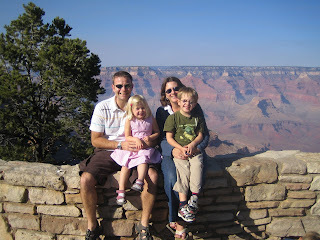 On Friday we went to the South Rim of the Grand Canyon where Allen went off in a helicopter ride and Carrie, me and the children did a lovely walk avoiding the edge of the Canyon but collecting many 'treasures' along the way (luckily they were left in Page!). The Grand Canyon is a lot bigger than I thought for - silly to say that perhaps, but if you've seen the real thing you'll know what I mean. Allen and I want to return and hope to stay in the actual park next time (Carrie lives about 2 and a half hours away). Had to leave on Sunday but hope to visit again and also meet up for a camping trip in the Spring. 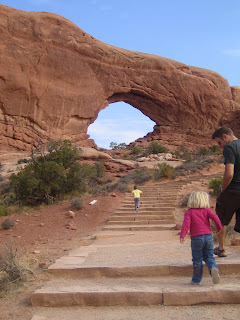 Stopped at Arches National Park on the way back - see photo. Another amazing landscape. Arrived back in Denver Monday PM a little tired but really pleased to have done the trip. Harvest day out at school tomorrow and then Halloween. Jacob's varying between being the Red Power Ranger and a bat! Abi will be a princess no matter what! man, it looks so fun to visit out there. owen is going to be superman for halloween and has insisted on decorating our front windows with white trash bags upon which he has drawn pumpkin faces. i can't believe i taped those up on the windows! miss you guys! Don't worry about the teddy it has not been missed! Got Jacob a bat like thing to wear although I bet he'll change his mind! Abi's wearing her new tiara at the moment. Got to go and clear leaves as they all seemed to have fallen off at the same time. Abi was chanting Jake and Annie in the car this morning! I just signed up to send comments. I love reading about your adventures. I went to the Grand Canyon in 1996 and was awe-struck by the size and magnificence of it. We see that your old house is still up for rent. 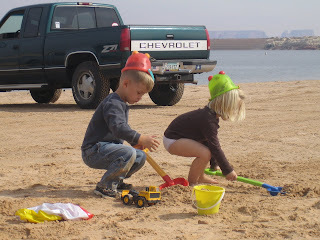 I went to Joey's Halloween parade this morning and party. Trying to stay away from eating to many chocolates- will see how it goes! What a change in weather! Grandma's gone but we have a 'new' car!